From major franchises to remakes and brutally clever indie hits, 2017 was a fantastic year for horror. Sure, you probably already know about heavy hitters like It and Get Out, but plenty of other great horror films were also released during the year. If you're in the mood for some spine-tingling additions to your queue, seek out any of these movies—our picks for the best horror movies of 2017. M. Night Shyamalan has had a rocky decade or so, but Split was a return to twisty form. A relatively small story focused on the abduction of a group of young women by a man with multiple personalities (James McAvoy), it made for a taut and claustrophobic thriller, with McAvoy doing an amazing job transitioning between his character's various identities. Critics praised his performance, as well as Shyamalan's ability to balance those shifting points of view—and channel the filmmaking prowess that made him a name to watch after The Sixth Sense. Even better? The director used the story as a Trojan horse to revisit the world he created in Unbreakable, setting up a third release that will bring together characters from both films. 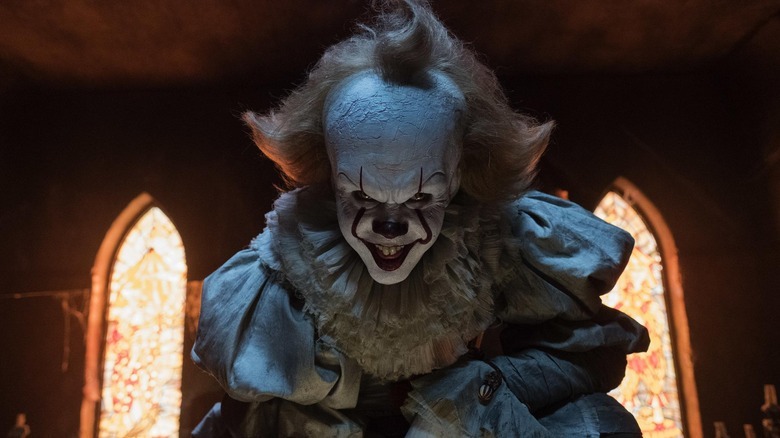 Stephen King's It was previously adapted as a TV miniseries in 1990, and that live-action version of the author's horror classic still gives us nightmares—but it's nothing compared to director Andy Muschietti's big-screen version. The film earned rave reviews, with critics hailing it as a terrifying and a clever exploration of the psychological trauma King captured so well in his novel. Bill Skarsgård's take on Pennywise the Clown is basically face-painted nightmare fuel, and taking a trip to the sewers of Derry is well worth the risk. Because hey, we all float down there, right? This isn't just one of the best horror movies of 2017—it's one of the best horror films of the past decade. Writer and director Jordan Peele leaves you guessing right up until the end, slowly ratcheting up the terror with a story that starts out like any other innocent, average dramedy. Peel back a few layers, though, and the story tackles race relations through the lens of a horror tale, serving up a sharp, thoughtful, funny blend of horror and social satire that treads almost a bit too close to reality at times in ways that will make your skin crawl. This indie horror flick focuses on an artist (played by Ethan Embry) who starts painting terrifying images after moving into a new home—and then a killer starts terrorizing him and his family. This scary look into the depths of human depravity doubles as a clever subversion of the horror movie tropes viewers have come to expect. It also helps that Embry and fellow co-star Shiri Appleby certainly bring their A-game to the material. The film was written and directed by Sean Byrne for IFC Midnight, marking Byrne as a filmmaker to watch in the future. If you're looking for a throwback to the classic days when machete-wielding killers prowled the woods and menaced unsuspecting teens, book a trip to director Taneli Mustonen's Lake Bodom, a classically styled slasher that focuses on the urban legend of a murderous night that occurred decades ago. A group of teens plan a trip to investigate and recreate the events, but it turns out they're in for a lot more than an homage. If you've watched a horror movie before, you know things are about to go deadly wrong for these kids, but even if it doesn't reinvent the genre, this is still a scary good time. This space-set sci-fi horror flick hit the sweet spot by throwing The Thing, Gravity and Alien into a blender, and the result was a whole lot of terrifying fun. It focuses on the crew of the International Space Station (led by Ryan Reynolds, Jake Gyllenhaal, Ariyon Bakare, and Hiroyuki Sanada) as they investigate a mysterious new life form that's been recovered on Mars. Their experiments quickly take a turn for the worse when they realize this alien creature might be a lot smarter than they'd given it credit for. In a year when the latest Alien film proved a letdown, Life is the perfect replacement. This post-apocalyptic, psychological horror flick picks up after a virus has wiped out most of the world's population. The story focuses on a family that has cut itself off from the rest of the world to avoid the plague, and when another group of survivors join them, paranoia and fear of what might be in the woods drives them beyond the edge. Critics praised the film for finding terror in the relationship among survivors, and bringing a refreshingly simple doom to a tale of the apocalypse. When you dabble with the dark arts, it's almost certainly destined to go wrong. That's the premise behind A Dark Song, which follows two people who retreat into a house in the woods to try and make contact with the dead—and sticks with you long after you've left the theater or turned off the TV, nestling into your psyche for some lingering scares. It might've initially flown under the radar, but A Dark Song is ready to terrify you now on streaming. The story of a vegetarian who develops a taste for raw meat is an interesting juxtaposition, but Raw wrings that premise for all it's worth and more, telling a story with deep social and emotional poignancy. The psycho-sexual horror outing made its debut at the Cannes Film Festival to wide acclaim, and once it found a wider audience, critics continued the love-fest. Reviews pointed to the clever spin it puts on the challenges of adolescence, and the way writer and director Julia Ducournau wraps that story in a gory masterpiece positively dripping with viscera and blood. This acclaimed psychological horror film, written and directed by Oz Perkins, stars Emma Roberts and follows a group of young women at a Catholic boarding school after pretty much everyone else has left for holiday. It's sparse and suspenseful, avoiding the cliches inherent in stories about young women in danger while introducing some clever twists. The Void is a throwback to the glory days of 1980s horror, with a healthy dose of Lovecraftian freakiness tossed in for good measure. It also came from some extremely humble beginnings, born as a crowdfunded film project from the minds of co-writers and directors Jeremy Gillespie and Steven Kostanski. The setup is relatively simple: a cop finds an injured man and takes him to a hospital, but then all hell breaks loose with cult members, ultimate evils and a whole lot of blood splatter. Critics raved about The Void, calling it a throwback to the days when filmmakers like George Romero and John Carpenter were cranking out releases on the regular. If that's your jam, The Void is a perfect slice of retro horror. This brutal thrill ride focuses on a family that's terrorized when their camping trip takes a horrific turn. The film is in the same vein as other murderous flicks such as Wolf Creek, with writer/director Damien Power zeroing in on the isolation that can come from being alone, in the woods, while being hunted. The story is kept frighteningly simple, with a sense of dread that builds quickly once the real threat is revealed. One of the smartest zombie movies in recent years, The Girl With All the Gifts uses the undead to explore some deeper emotional and philosophical questions. The story focuses on a group of children who are somehow immune to the disease, and the role they can play in saving humanity. It might be a post-apocalyptic zombie story with doses of sci-fi, but the film is packed with more than a few good scares. Critics called The Girl With All the Gifts a clever spin on the well-trodden zombie genre. Picking up after the end of the world, this Mexican horror flick follows a pair of siblings trying to survive the apocalypse. They take shelter in a structure, only to meet a man who may not be what he seems. This simple setup leads to one of the most brutal and intense films of the year—if you decide to see it, prepare to be shocked by its visceral visuals. The Conjuring has quickly become one of the biggest horror franchises of the decade, and the latest spinoff from the creepy mothership does not disappoint. Annabelle: Creation, the second film to focus on the murderous antique doll featured and mentioned in the main Conjuring films, jumps back in time to tell an early story from when Annabelle was still a relatively new (killer) toy. A marked improvement over the first Annabelle film, critics called it a surprisingly moody and effective horror yarn. With the Conjuring franchise still going strong, there's a pretty good chance we'll see Annabelle again sooner rather than later. If you're looking for a horror flick with some biting humor, make a date with Happy Death Day—it's Groundhog Day with a bloody slasher twist. The film stars Jessica Rothe (La La Land) as a college student who's murdered on her birthday, then keeps reliving it over and over until she can figure out who killed her. The film comes from director Christopher Landon (Paranormal Activity: The Marked Ones) and the acclaimed mid-budget horror banner Blumhouse (Split, Get Out). Critics are digging it, saying the story has "spunky charm" and calling the time loop hook "irresistible." Though it's obviously a horror film, what really holds Happy Death Day together is the humor, brought to life by Rothe's genre-juggling performance. Netflix's The Babysitter is one heck of a fun little horror romp, best described as an R-rated, blood-soaked, titillating modern-day spin on a 1980s horror B-movie. It's obviously low-budget, but that approach works best for what director McG (Charlie's Angels) is doing here. The cast of Samara Weaving, Judah Lewis, Robbie Amell, Bella Thorne and Hana Mae Lee are obviously having a lot of fun with the material, and though it's not high art, The Babysitter is still well worth the hour-and-a-half it takes to kick back and enjoy it. It's a cheesy good time, and reviewers called it out as such. If that's what you're looking for, The Babysitter might just be the silly little surprise of the year. Critics are calling this one "Home Alone meets The Strangers," and it's even set at Christmas in case you missed those Home Alone parallels. The film puts a spin on the home invasion thriller formula, following a group of kids and their babysitter when a group of home invaders break in. That's when things get interesting, though. The kids start setting booby traps and have a whole lot of R-rated fun in the process to protect the house—and there may even be a twist or two before the credits roll. Reviewers have absolutely loved this one, saying it "decks the halls with blood," and is "consistently surprising and unusually well-acted." The cast includes Levi Miller, Olivia DeJonge, Ed Oxenbould, Dacre Montgomery, and Patrick Warburton. If you're looking for a VHS-era throwback, the 1990s-set Super Dark Times finds terror in the mundanity of suburbia. The visceral thriller is described as "a coming-of-age nightmare" and landed to almost universal critical acclaim. The story follows a group of teens who are driven apart following the disappearance of another teen and an impulsive, heated moment. Critics have praised the film as a meditation on not only the loss of innocence, but also a bygone world that existed before the Columbine school shooting and 9/11 terrorist attack. The cast includes Owen Campbell, Charlie Tahan, Elizabeth Cappuccino, Amy Hargreaves, and Max Talisman. This Norwegian indie horror outing follows a young student (played by Eili Harboe) who discovers she has strange powers while exploring a new romantic relationship. Critics have been calling it smart, stylish, creepy and unnerving—all in the best ways possible. The film scored solid acclaim following a premiere at the 2017 Toronto International Film Festival, and was the Norwegian representative in the Best Foreign Language Film category at the Academy Awards. It's worth checking out for a slow boil change of pace within the genre—it does an effective job of blending themes of sexuality and discovery with the otherness of the supernatural, and finds horror in the quiet moments between the scares. It seems like even Stephen King's notebook doodles could land a film deal these days, and his latest adaptation quietly slipped under the radar—but it's still one of the best of the bunch. Netflix adapted the small-scale, harrowing tale of isolation titled Gerald's Game into an excellent film starring Carla Gugino. The story follows a wife who's left shackled to a bed after a weekend getaway with her husband takes a dark turn when he suddenly dies of a heart attack. Gugino's Jesse is forced to face everything from starvation to her own doubts and demons as she tries to find a way to escape and survive. Critics raved about it, calling Gerald's Game a fantastic character study of one woman's psyche that turned what may considered an unfilmable story into a "gripping, visceral thriller." The Child's Play franchise is still going strong all these decades later, and critics say the latest sequel does an excellent job of leaning into what has always worked about Chucky: it's "self-spoofing," "lowbrow," and an absolute "bloodbath." The story finds the evil doll back in action to torture Fiona Dourif's Nica while she's serving out a stint in an asylum. The cast also features Chucky's original rival Andy from Child's Play (played by Alex Vincent), as well as Chucky's on-again, off-again wife Tiffany, played by Jennifer Tilly. After a string of uneven sequels, Cult of Chucky is a return to form for one of the wackiest horror franchises on the market, and well worth a look if you'd lost interest a few installments ago.